Even though our RSC is toast after this July we’ve continued our support for the eAssessment Scotland Conference until that time. Our involvement with eAS goes back to the very beginning with 2009’s Strategies across sectors and since then this event has continued to grow becoming the largest UK conference dedicated to e-assessment. From the link above click ‘Use this spreadsheet’. This will take you in to the form view. From here you can add additional questions (you can edit at a later point if you prefer). Protected names (e.g. field names that are used later in the script) are First Name, Email Address, Twitter Username and ‘Tweet Out’. You can change these if you really need to, but you’ll also have to find them in the script. On the ‘Public’ sheet enter the sessionIDs and sessionName you used in the Form. Note: these must exactly match the Form values or the embed later on won’t work. In the Max column you can also change the number of delegates. In the Count column there is a formula that counts the of the sessionID in the ‘Bookings’ sheet. 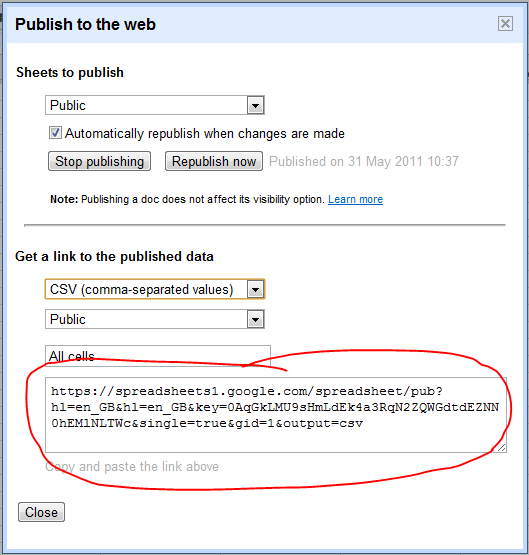 If you are embedding the form (as explained later) you’ll also need to publish the Public sheet by selecting Share –> Publish as a web page and changing Sheets to publish to ‘Public’. Register for an API key with Twitter (if you’ve already registered a Google Spreadsheet/Twitter mashup you can reuse your existing Consumer Key/Consumer Secret). Once finished filling in the form and accepting Twitter’s terms and conditions you’ll see a summary page which includes a Consumer Key and Consumer Secret. Take a copy of these as you’ll need them later. Back in the spreadsheet there should be a Bookings menu option with Configure Twitter (you might need to select this option twice, once to authorize the script and a second time to enter the customer key and secret saved from earlier. Now in the Spreadsheet select Tools > Script Editor … and from the Script Editor window select Run > authorize. This should bring up an authorization message box, click on Authorize. In the Twitter Authorization window enter your login details of the event Twitter account and select ‘Allow’. Quick recap: we’ve copied the template spreadsheet; edited the booking form; customised the email templates; and if needed connected the spreadsheet to twitter. Next I’m going to show you how to embed the Google Form in another website. This is again an optional step, you can just use the live Google Form but you won’t be able to prevent full parallel sessions from being selected (unless you manually remove them from the form). $dataUrl – you can get this value by opening your Google Spreadsheet and clicking Share (top right) –> Publish as webpage. This should open a window similar to the one below. 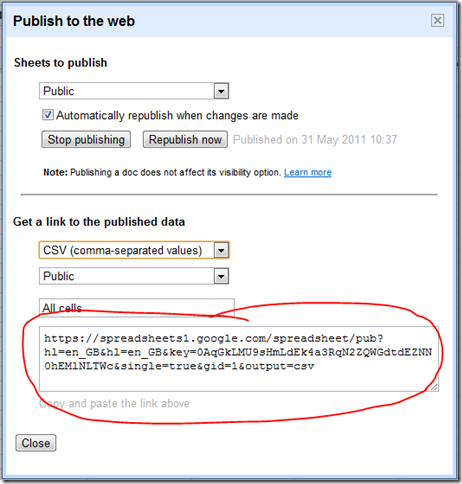 Things to check are you are publishing ‘Public’ with automatic republish on changes and that the get a linkto the published data is CSV and the Public sheet. The value you need for $dataUrl is the entire link generated in the text area. What the code does is read the Google Form and sessions counts and then modifies a copy of the original form. To prevent incomplete data from being submitting the code also uses the jQuery Validation plugin to check the data. At this point you are probably due another cup of tea. I realise that this isn’t an ‘out of the box’ solution, but hopefully there is another of an outline to help you do something similar/use information here to solve a different problem/loose many hours of sleep. PS I’ll be doing my App, App and Away workshop at eAS11 which has a couple of places left. This session covers very simple uses of Google Forms and Apps Script to support assessment. Nice job Martin! Thanks for sharing. Unfortunately I can’t see the template. Google says it does not exist.